American Hornbeam is a small, slow- growing understory tree that generally grows to 25 feet tall. It is so named because of the hardness of the wood which reminded settlers of a horn and an Old English term for beam which means tree. Another name for this tree is “Musclewood”. While looking at the plant’s trunk and branches they look like a flexing muscle because of the structure of the wood and the coloring of the bark. That “muscular” feature is perhaps its best identifying characteristic. American Hornbeam is a member of the Betulaceae or Birch Family. Its flower is a non-conspicuous catkin, and the plant is monoecious, meaning both male and female flowers are present on the same plant. The foliage is nice and clean throughout the season with not many pest problems. 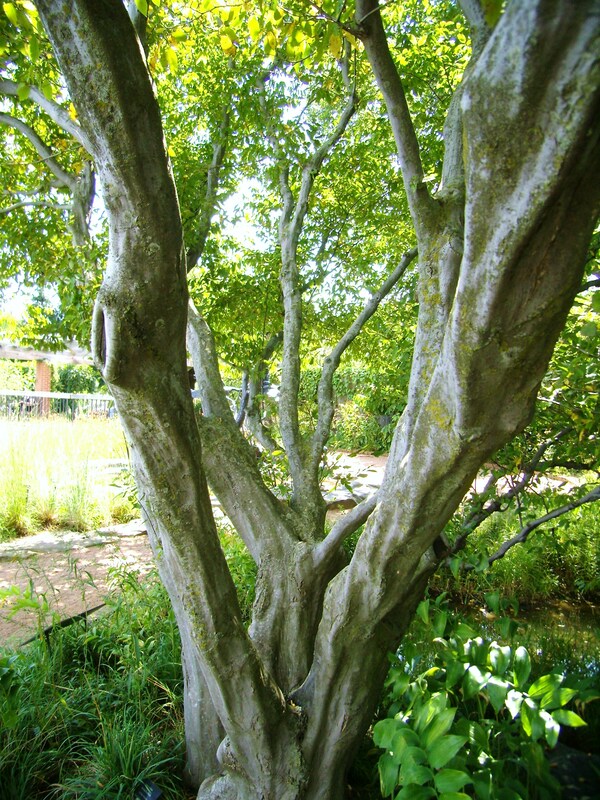 The tree is best suited for growing in moist, well drained soils in partial sun to moderate shade, although it is adaptable and will acclimate to less than ideal situations. This tree’s true beauty is revealed in the autumn when its deciduous foliage turns varying shades of yellow and orange, and then eventually drops to expose the muscular branching structure in winter. American Hornbeam is a great selection for the woodland garden. It is a species that has changed very little with cultivar selection like so many others. So when an American Hornbeam is planted in the landscape, there is a piece of pure natural beauty in the garden. 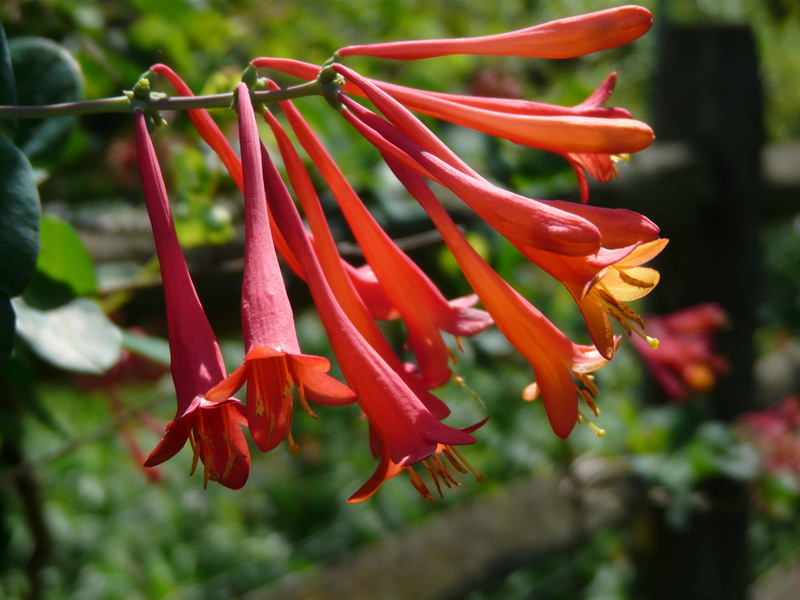 Coral Honeysuckle is a climbing, semi-evergreen vine with beautiful, bright red flowers. This woody vine has a native range from Connecticut to Nebraska and south to Florida and Texas. It climbs its way up supporting structures by twining and twisting its way skyward. In nature, this species can be found growing on fence rows, in open woodlands and along roadsides, but unlike its Asian cousin, Coral Honeysuckle is not invasive. In the spring, the vine is covered in red to reddish-orange, trumpet shaped flowers that are sweetly scented and are often visited by hummingbirds. Coral Honeysuckle is in the Caprifoliacea or Honeysuckle family. The vine has simple leaves that reach 1”-3” long and are arranged oppositely on the stem. The leaf color is a blue-green with a powdery underside. Its flowers are tubular clusters and each individual flower is up to 2” long. The plant has a very large bloom in spring, and then blooms again sporadically throughout the summer. In autumn, leaves fall off still green, but deep red berries are left behind as a source of food for songbirds and other wildlife. Coral Honeysuckle will grow in some shade but the flowering will be greatly reduced. The vine can reach 15’-20’ long and is one of the showiest of the vining honeysuckles. The plant is easy to grow; just site it in an area with full sun with moist soil that is well drained. There are no serious pest problems, but powdery mildew and black spot can cause occasional cosmetic damage to the leaves. Prune after flowering to open up the plant and increase air flow through the branches. Coral Honeysuckle makes a beautiful specimen plant in the garden and its spring blooms are real showstoppers!